On July 8th a small group of Christian Pilgrims will embark on a spiritual pilgrimage to China, visiting Christian Churches and Seminaries as well as historical and cultural sites, across that vast country. The little group is comprised of United’s Pastor, Joe Tripp, United’s Coordinator for Health Ministries, Peggy Matteson, United’s Coordinator for Children’s Ministries, Megan Weymouth, a member of United’s youth, Alicia Perras, and they are joined by Daniel McDuffie from Sandusky, OH, Dana Baker from Cleveland, OH, and Pam Koller from Edgemont, SD. The four youth on this pilgrimage were handpicked by their youth leaders, pastors, and conferences across America to be a part of this program. On Father’s Day weekend, the seven pilgrims met here at United for the pre-pilgrimage gathering designed to prepare them for their expedition by cultivating community-building, the history and culture of China, the presence of the Christian Church in China, the Pilgrimage Itinerary, the logistics of travel to China, and the five spiritual disciplines of our journey. 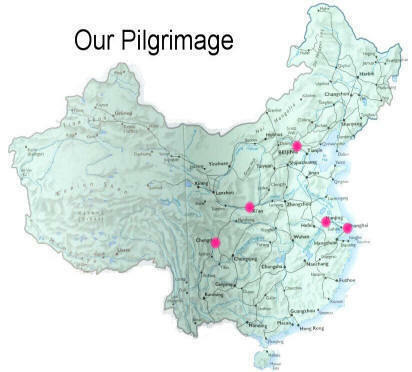 While traversing across China, this group will not only be engaging in a variety of spiritual disciplines (labyrinth, lectio divina, journalizing, sensory prayer, and awareness examen) but will use a daily meditation journal as well. If you would like to follow our journey, day-by-day, our daily journal will be posted on this page. If you find that on a particular day an entry is NOT posted, please be patient … some hotels (and even some cities) will not have Internet connection, so we’ll have to wait until the next location. In the meantime, thank you all for your prayers and support as we make this spiritual journey. I know that we will carry those prayers with us to the other side of the world, and will bring them back sevenfold. God bless all of you.